Potato Corn Chowder is creamy, thick, flavorful and easy to make in the slow cooker. 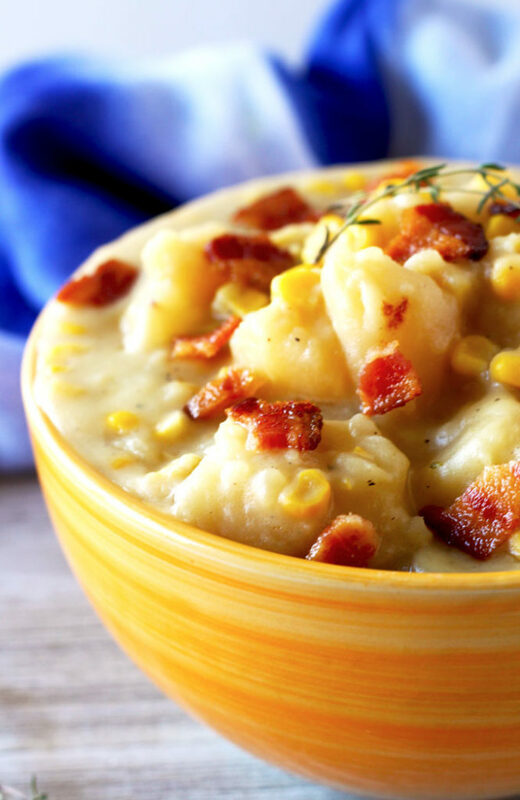 This hearty and delicious corn chowder features tender chunks of potato and creamy corn. Top it with crispy bacon for the ultimate chowder recipe! 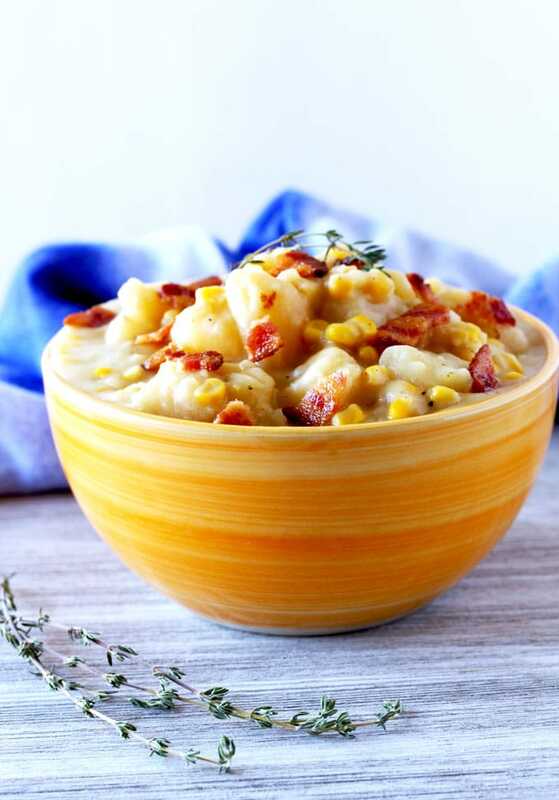 This flavor packed corn chowder recipe can be made with fresh or frozen corn. 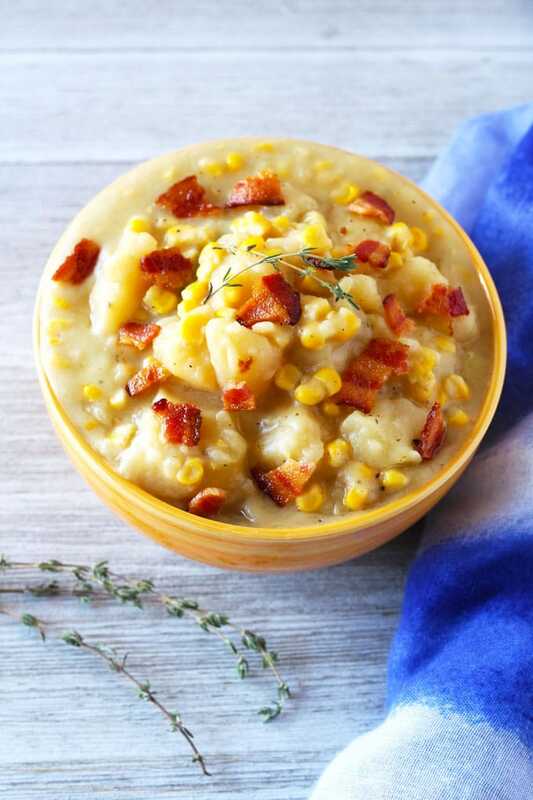 You can enjoy this chowder on cool summer nights while corn is at peak season or in the middle of winter when you need a bowl of comfort food to warm you up from the inside! 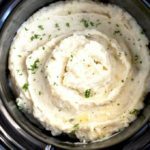 I love easy crock pot soup recipes that can be made with minimal effort. 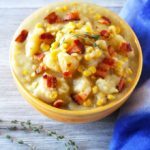 Just like my Creamy Slow Cooker Ham and Potato Soup, this corn chowder recipe is what I call “dump and go”. Place all the ingredients in your crock pot and go about your day. Dinner will be ready and waiting for you when you need it! How amazing is that? Creamy Slow Cooker Ham and Potato Soup ready! A chowder is a thick and rich soup usually made with cream, milk and sometimes a roux (a combination of flour and butter). Chowders are often chunky in texture and incredibly creamy. 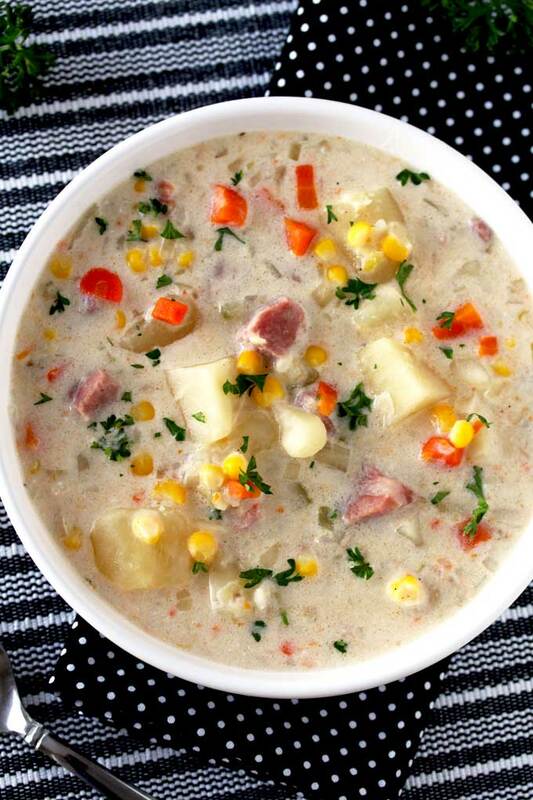 Seafood chowders, corn and potato chowders are among the most popular. How To Make Your Chowder Thick? Some chowder recipes use a roux as a base to make the soup thick. 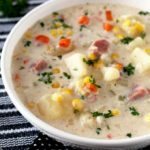 In this corn chowder recipe however, I take advantage of the starch in the potatoes to give this hearty chowder a creamy and thick consistency. I like to remove some of the potatoes from the soup, mash them and then return them to the crock pot. This method not only provides a thick texture but also creaminess. It also helps reducing the amount of cream you need to use yet still provides richness to the soup. RECIPE TIP: If you like a thicker chowder, after adding the cream cook the chowder a little bit longer than the 30 minutes specified in the recipe. I like to use russet potatoes for this chowder recipe because of their creamy texture. Peel and chop the potatoes into 1-inch cubes. They don’t have to be perfect, some of them will be mashed to give this soup a thick consistency without using a roux (flour and butter mixture). I use frozen corn for convenience but fresh or canned corn works also. Place the potatoes, corn, garlic, thyme and stock into the slow cooker. Season with salt, pepper and chicken bouillon. The bouillon is optional but I highly recommend it. It adds a lot of extra flavor to this simple corn chowder. When the potatoes are tender, I remove a big scoop of potatoes and mash them with a fork. Then, I stir in the mashed potatoes back into the chowder. This helps thicken the the soup without having to add flour – keeping this creamy chowder recipe gluten free. Add some heavy cream and cook for an additional 30 minutes. Be ready for the most delicious, soul warming, comforting potato chowder ever! Take this slow cooker soup to the next level by topping it with smoky and crispy bacon! I share all my secrets for perfect bacon in this post How To Cook Bacon in the Oven! No mess, crispy bacon every time! Keep this chowder recipe vegetarian by using vegetable stock. You can use homemade chicken stock or store bought. Here’s my recipe for Basic Chicken Stock. Homemade is always best and has the best flavor. Make it in big batches and freeze it for later use! You can use half and half to cut on the calories but you need such a little amount of cream, you might as well use the real deal! DON’T FORGET TO CHECK THE RECIPE VIDEO BELOW! 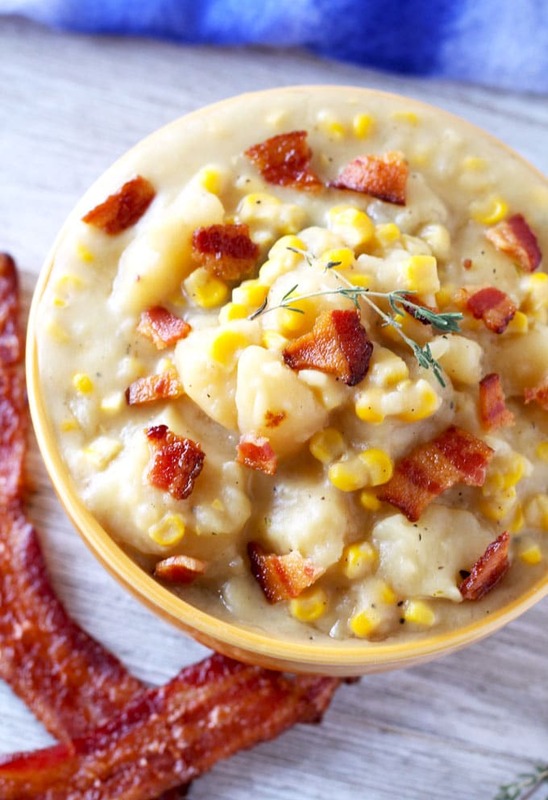 WANT TO TRY THIS CREAMY POTATO CORN CHOWDER? PIN IT TO YOUR SOUPS, CROCK POT OR DINNER BOARD!! Potato Corn Chowder is creamy, thick, flavorful and easy to make in the slow cooker. 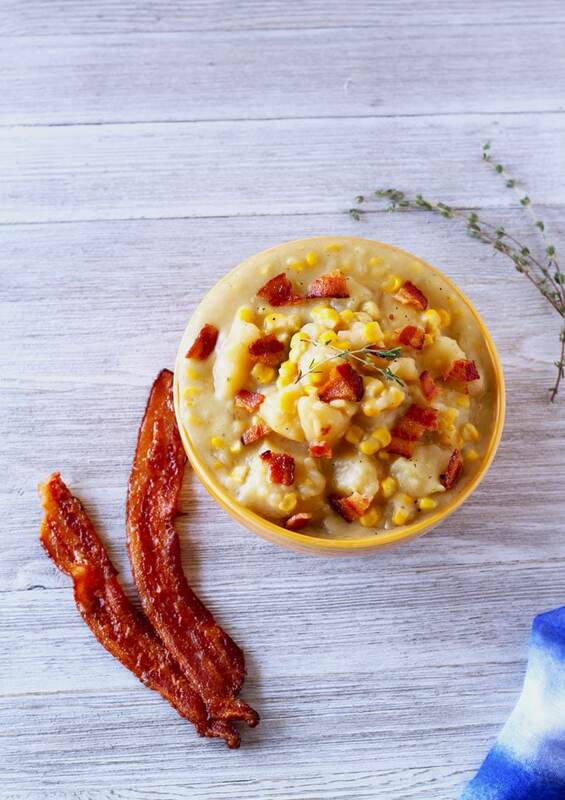 This recipe for corn chowder features tender chunks of potato and creamy corn. Top it with crispy bacon for the most delicious chowder recipe! Place the potatoes, the corn, onion, garlic, and thyme in the slow cooker. Pour the chicken broth over. Season generously with salt and pepper. Add the chicken bouillon (if using). Stir well. Cover and cook on low for 6 - 7 hours or on high for 3 - 4 hours or until the potatoes are tender and cooked through. Scoop out some of the potatoes onto a plate. Mash the potatoes with a fork and return to the crock pot, stirring them in to thicken the broth. Stir in heavy cream cover, and cook on low for an additional 30 minutes. You can use fresh or canned corn. Great recipe. We skip the bacon sometimes and still so good and creamy. 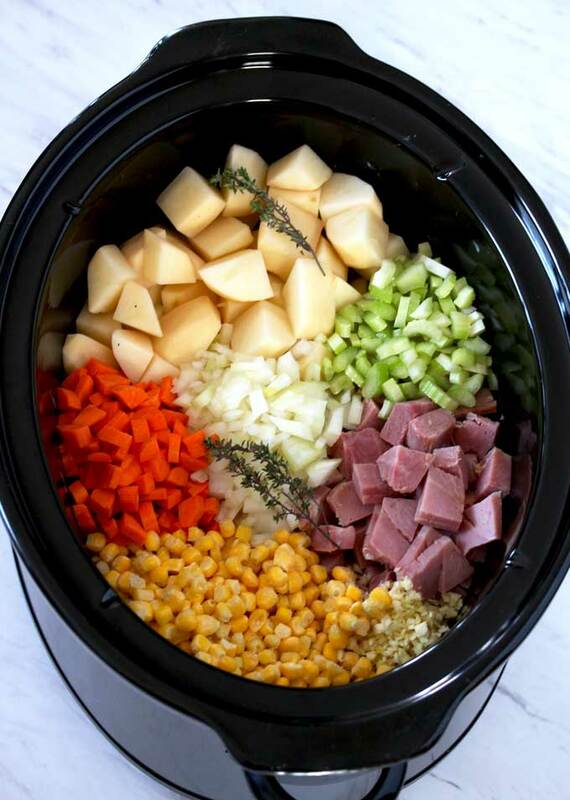 This is the best crock pot soup! I make it all the time. Very creamy and flavorful. Love the bacon topping too. This was amazing! Such good flavor and very easy! A keeper. Thank you!! Glad to hear! I’ve seen this soup with shrimp in it ! When do you think I should add the cooked shrimp ?? Hi Alexis, if you add cooked shrimp it should be at the end. However, you won’t get much “shrimp flavor” if you do this. If you want a shrimp/potato chowder you must use raw shrimp and perhaps some shrimp broth. If I could give this 10 stars I would! It is soooo good! I doubled the amount of corn, and my kids went crazy over it. Thank you for sharing! Thank you so much! I am so glad you all liked it!! Hi Joely, I think I would cut the quantities a little bit to be save. Hope you like it as much as we do!! Thanks!! 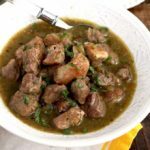 Great recipe…I added fully cooked sausage to add some protein and it was a big hit! no bay leaf? I am going to make this on Sunday. Thanks for sharing! You can add a bay leaf! Why mot? Enjoy!